The folks at The Music Zoo are currently listing this new Suhr Classic (item#110619102058) with the official finish designation "Root Beer Drip". I'm a big root beer fan myself, but this finish actually reminds me more of when you roast a beef prime rib on a rack, and get those drippings in the bottom of the pan that are used to make gravy. Yeah, that's what it looks like to me alright. But I guess Root Beer Drip sounds better for a guitar finish than "Beef Pan Drippings". So Root Beer Drip it shall be. But of course, there's also "Starbucks Parking Lot Hurl"? 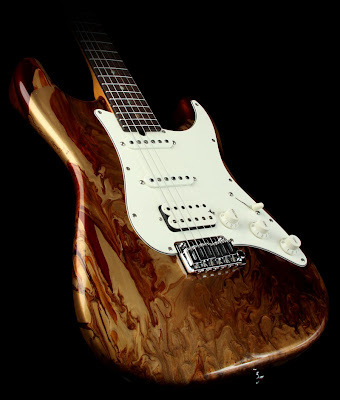 Moving right along from finish considerations, our Suhr Classic features Alder body, a slim "C" mahogany neck, 10-14" compound radius, medium stainless steel frets in Indian Rosewood, Sperzels, 2-point trem-bridge, Fletcher-Landau singles and SSV at the bridge. Guitar includes hard case and factory paperwork. Y'know we could also call the finish "Jiffy Lube Nightmare" or "Arizona Dashboard Heath Bar". See, if anything, it's an interestingly thought provoking finish.